This apartment is spacious with 62m² and is located east on the first floor of the apartment building. It is by the East-south orientation very bright and friendly and is divided into bedroom with double bed, chest of drawers and large closet, living areas and a small balcony, and a bathroom. The rooms are separated by only a few steps. The living area is equipped with a beautiful French table and four matching chairs. A fireplace provides warmth on cool nights and big Divan invites you to relax. All the furniture in this apartment are from the 18th century. And 19th Century and have been lovingly restored. Also typical of the region beamed ceiling was revived carefully. The kitchen is part of the living area and is equipped with four burner gas hob, extractor, sink unit, refrigerator, coffee maker, utensils, "Villeroy Boch +" cutlery, crockery and glasses. Region of the noble red and white wines, away from tourist crowds and industry, an oasis of ancient culture of wine and gourmet tradition, in the lovely, wide-ranging wine hills of the Alto Monferrato south of Asti and Alba, between Milan, Turin and Genoa, next healing spas and near the Riviera - is this sympathetically renovated winery house from the 18th century. Century with its recently completed swimming pool, surrounded by vineyards on a hill with beautiful views and its below are completely different apartments for people who are looking for a holiday rest, relaxation, freedom and individuality in a comfortable atmosphere. Our pool: The swimming pool with its 11x5m is available each 7-22 clock and is of Figure 1. March to 15th October. Organic viticulture: We do not use in the processing of our land to the use of systemic pesticides, herbicides and fungicides - and are state certified as an organic farm. Piedmont Living Tradition: We provide the space for your needs. Whether precious porcelain in the kitchens, fine materials in the residential areas or antique furniture in bedrooms: we offer that certain level for the cultivated eye. We have incorporated the charm and character of the ancient wine region gently in the renovation of the winery from the 18th century and receive the soul of the southern Piedmont. I will try to help you with finding all the information you need. The bathroom has a bath with bidet and large windows offering beautiful views of the Valle San Giovanni with your vineyards. WIFI is available all around the house and garden. The furnishings are all original restored pieces from the 18th and 19th Century. Please note that the apartment can accommodate up to four people, in which case the living room is used as a second bedroom! At the same time also a 2 bedroom apartment is available! Et dejligt ophold men det vil være godt hvis sengetøj m.m var vasket uden parfume . Skønt og fredeligt sted. Dejligt man kunne plukke friske blommer og figner og krydderurter. Pænt og rent. Fin pool. Meget sød værtinde. Great place, nice and quiet. Super host. It was a great place. Real Italian country style house and with instructions from the owner to use everything in the house ! Only thing which could have bee better was the kitchen facilities; it was minimal and really only sufficient for breakfast and light lunch. Bis auf eine fehlende Duschabtrennung ( nachdem Duschen schwamm alles ) und etwas spärliches Kücheninventar hat es uns gut gefallen. Der Vermieter ist sehr freundlich und mehrsprachig und hat gute Restaurantempfehlungen für seine Gäste. Nightlife oder irgendwelche Bars oder Cafes in nächster Nähe sind allerdings Fehlanzeige. Sehr guter Ausgangspunkt für die Erkundung des Piemonts. Gleichzeitig sehr schöne Location, um sich zu erholen. Die Ferienwohnungen sind sehr schön eingerichtet. Nicht vermisst, aber nicht in den Wohnungen vorhanden: TV. Der Vermieter ist außerordentlich freundlich und hilfsbereit. Die Wohnungen (es gibt mehr als die zwei auf Fewo-direkt genannten) sind auf der Homepage ausführlicher beschrieben. Exzellente Basis für Ausflüge - sehr zentral! Sehr schön wars auf der Residenza Cá d´Masseu. Gepflegt, schön eingerichtet, alles antike Möbel und sehr elegant. Freundlicher vermieter, großer Pool. Mit dem Wetter hatten wir auch Glück und vor allem die nahe gelegenen Michelin Stars haben es uns angetan. Alles sehr nahe und auch bis Alba oder Asti nur 1/2 Stunde mit dem Auto durch die Weinberge. Wir waren mit Freunden für einige Tage im wunderbaren Piemont und haben die beiden Wohnungen Alba + Barolo bewohnt. Beide Wohnungen sind mit edlen, antiken Möbeln eingerichtet - sehr geschmackvoll! Der Garten und der Pool sind gepflegt und groß und man befindet sich wirklich mitten in den Weinbergen - TOLL! Wir kommen nächstes Jahr wieder - schon gebucht! 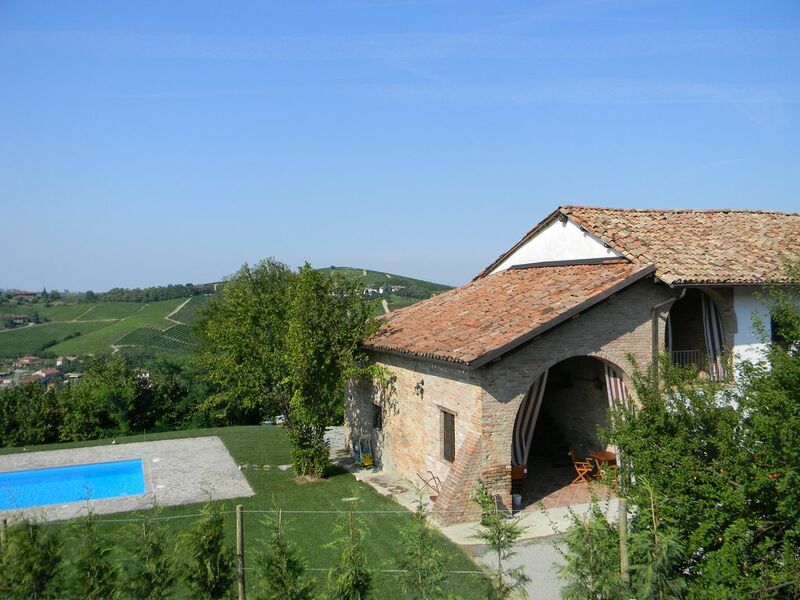 The Residenza Cá d'Masseu is surrounded by vineyards, in the midst of Valle San Giovanni alone on a hill with beautiful views and offers very good, nearby excursions. In the immediate vicinity of the apartment building you will find several towns and cities with excellent infrastructure for daily needs such as supermarkets, boutiques and markets as well as many attractions. (Eg 'Contratto' UNESCO World Heritage Site - 3km, Le Langhe Monferrato + hiking (UNESCO World Heritage Site). The nearest locations include Nizza Monferrato, Calamandrana, Canelli and San Marzano Oliveto. Alba, Asti, Acqui Terme, Alessandria, Cuneo, Barolo, Barbaresco and many other cities can be reached within a few minutes by car, the cities of Milan, Genoa and Turin in about an hour. The nearest beach on the Italian Riviera, an hour away, the world famous San Remo about 2 hours by car and the French Côte d'Azur about 2.5 hours. The Serravalle Outlet can be reached in 40 minutes. Load the Locally 11x5m pool, pergola and garden to relax. Golf: The nearest golf course lies in Acqui Terme and offers day passes for 15 €. Die restlichen 50% sind vor Ort bei der Ankunft zu bezahlen.